Not only that, but we have a hidden discount code in flowers on some of the blogs so make sure you start at the very beginning of the Blog Hop and jot them down in order and you will get a whopping 25% discount when you apply the code to the shop. 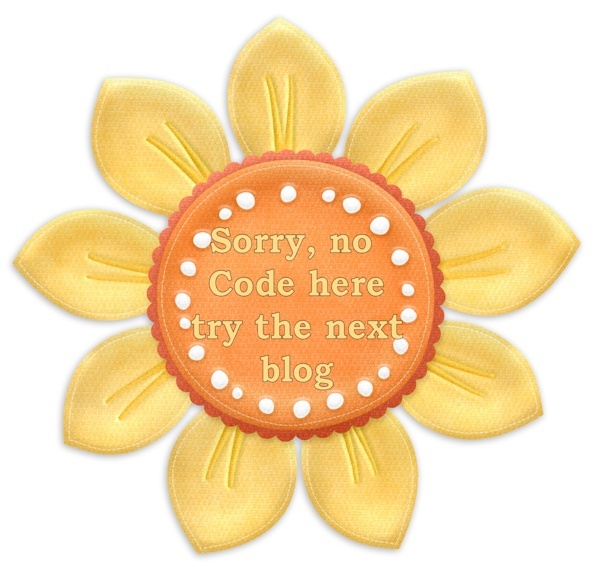 The image I used is the adorable "Sunshine." I'm sure you'll agree that he's very cute, as are the other five images that Mo has created just for this Hop! I want them all, and you will, too! Inside: "A mother's love is like sunshine that warms you all over. Happy Mother's Day!" Images: "Sunshine" ftom Mo's Digital Pencil, Stamped sentiment from SU! I had so much fun coloring him that I made two cards! On this one I used the sentiment that comes with him. I also altered a ticket to include a computer-generated sentiment and some hearts. Inside: "Wishing you a day filled with sunshine and rainbows! Happy Birthday!" If you're on track, you came here from our talented Debby, and your next stop is at Gretha's! Have fun, and be sure to gather the flowers along the way! The blog hop order is as follows and, in addition to collecting the flower codes for a 25% discount, you can also win the chance of receiving a $5 gift voucher for Mo’s shop...we have 4 to give away as spot prizes from the comments left on our blogs! 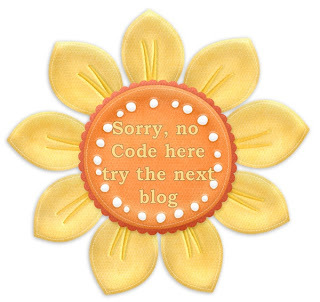 So remember to leave some love in the way of a comment on each blog you hop to. I have a flower for you to collect. You should collect a total of 6 flowers on your "Blog Hop" travels. Some have numbers or letters...and some say "Try next Blog". Once you've collect all 6 in order, they will spell a code that you can use to get 25% off your order at Mo’s Digital Pencil shop! Happy Hopping! Super sweet card and he's just darling. Love your colouring and details. what a fun card - the image is wonderful and i love the sun!! He is just adorable, love both the cards you created. Both your cards are so adorable Elaine!! Fabulous cards! I love this image - he is so sweet! 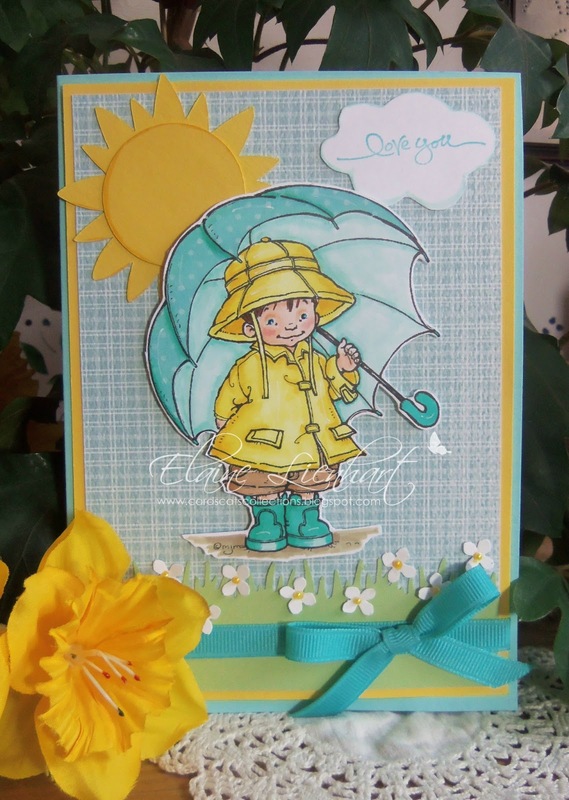 Your cards are so fresh and sunny - here comes Spring - hoorah! Two adorable cards! Love this little boy, too. I love the soft version of the card with the aqua and yellows and the sweet little flowers at the bottom. He is such a cute image...both cards are gorgeous! Thanks for the hop and the chance to win! Both of your cards are SO neat!! I love how the first card is soft in color, and I especially love the second one with the rainbow on it!! They are both totally gorgeous, Elaine! Love this new little guy and what you've done with him! Precious Elaine and you know that first card is in my fave colors. :-) Great cards! Cute. There are so sunny. he is indeed very cute! your first card is my favourite, I love the colours you have used. Love the colors on your first card!! 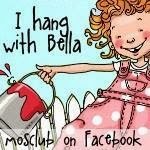 This is an adorable image and you have used it beautifully! He is adorable and have two absolutely stunning cards! Both cards are fantastic! Especially love the color combo on your first one!! Soo super adorable.. Really awesome cards, and beautiful coloring.. Wonderful cards, Elaine! The image is adorable and you've colored it beautifully on both! Both designs are super, Elaine. I really like the colors of the first card and the added sentiment of the second. I loved the pastel colors and everything about the first card and then I saw the second one - it's so cheery. Love them both. He's darling. I love your color combinations and your coloring is awesome! I will be pinning one! He is a doll. Great job! both your creations are super cute!!! Great work!! These cards are adorable! My favorite is the first one, loved the coloring, the plaid background and the fuzzy cutting. So sweet! Both cards are beautiful and the images delightful. 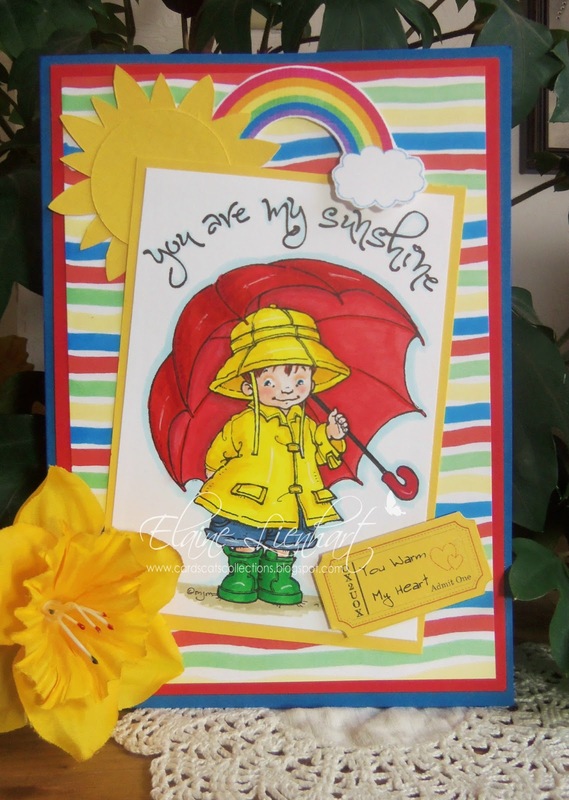 Fab cards, so sunny even though the character is in the rain, just brilliant! What a lot of work you have gone to for our pleasure. Thank you. He is just adorable. Wow...you even did two card...how amazing! Both are fantastic!!! Great Blog Hop and thanks for the chance to win! Both cards are adorable, really like the "springy" patterned papers you used! Bright and beautiful! Lovely image! Super card! Beautiful card, sweet image and cute sentiment! Darling card, sweet image and lovely coloring. Great sentiment. Nice inspirations with colors and dies and ribbons. Like both of your cards! Both cards are gorgeous, I really love the colours on the first one, so gorgeous and spring like! Both Cards are beautiful. Your colouring is wonderful and the image is cute. The different colour combinations are nice and the layout are good. Great Card--love the colors and that image is sweet! So different but both so beautiful. Love your adorable image! Adorable cards...especially love the first one! Both of your cards are really beautiful! Both cards are utterly delightful, Elaine, the image is simply too cute for word and you created two wonderful scenes! Great work! Both are absolutely fabulous and so cute too Elaine. Great jobs! Love the colouring on both! Both are beautiful cards but my fave has to be the first one - love the blue/yellow combo! Love your card, Elaine. Perfect colors, too! Two gorgeous cards Elaine. The image is so very sweet and I love the designs you used on each one of them! Thanks so much for sharing! Wow, just two lovely cards! Love both your cards Elaine, they are so different even if you used the same image! This is so fun! To be part of this Blog Hop is so inspiring! I have never had so many comments on any of my blog entries before. We must do this again! So proud to showcase these gorgeous new stamps too! these are amazing...thank you for showing the great variance from one image. I just love them both & the hop is awesome!!! Elaine, what a great job using this sweet little guy. And not once but two cards!! You're very industrious... and very talented. TFS! He's such a sweetie and so appropriate for all the rain we've had over the last few days! Lovely card Elaine. Both Beautiful cards, I love the image and it looks so different made up in the different colours. Beautiful creations. Like both versions. I love the new images. You did a great job showing the versatility of this adorable image. 2 beautiful cards with another great Mo Manning image! Such an adorable image and both cards are perfect! Love both of them! Love how your cards turned out. Very cute. Great cheery card, love it. Wow both of these cards rock!-smile Love them. Both creations are so cute. oooh I love both your cards Elaine I agree he is a super image!! Both cards are gorgeous and i love that sweet image. Great inspiration. As I already told you, I love both cards! This little guy is super cute and you showcased him absolutely fanstic.